Eight billion micro-organisms per capsule. Contains 5 probiotic species delivered in stomach acid-resistant capsules. Manufactured using a high-quality freeze-drying process and offering guaranteed probiotic viability. Helps optimise the immune system, reduce systemic inflammation and relieve gastrointestinal problems. Probio Forte is a perfectly-balanced blend of five probiotic species containing a total of 8 billion beneficial bacteria per capsule. These five species of probiotics are among the most widely-studied: Bifidobacterium lactis BL 2211, Lactobacillus acidophilus NCFM BL 2027, Lactobacillus casei BL 2401, Lactobacillus plantarum BL 2203 and Lactobacillus lactis 2618. They have the potential to modify a number of physiological and metabolic parameters such as maturation of the immune system, strengthening of the intestinal barrier, optimisation of digestion, production of neurotransmitters that benefit mental health, breakdown of toxins and exclusion of bacteria through competition. reach the site of action – the gut - in sufficient quantities (using high-tech DR Caps™). Who is Probio Forte aimed at? those who are simply keen to improve their daily health and well-being. What benefits does Probio Forte offer? competes directly with the bacteria that cause infections (such as Helicobacter pylori (13)). What is in Probio Forte? Probio Forte contains 5 different probiotics that are among the most widely-studied by the scientific community. Species from the Bifidobacterium genus have been used in dietary supplement form for several decades (14) and are completely safe to use. Bifidobacterium lactis is recognised for its effect on the immune system (15): a number of studies have demonstrated its ability to both reduce levels of various cytokines involved in systemic inflammation (tumour necrosis factor, interleukin 10) (16), and improve phagocyte capacity and Natural Killer (NK) cell activity (17). Species from the Lactobacillus genus: acidophilus (NCFM BL 2027), casei (BL 2401), plantarum (BL 2203) and lactis (BL 2618). These species are highly-regarded by the scientific community. They are found in fermented foods such as yogurt and kefir. Lactobacillus acidophilus NCFM has actually been the subject of scientific research for more than 40 years: it was isolated from a human source in 1975 by Professor Stanley Gilliland and his team at North Carolina State University (18). These four species exert all the effects you’d expect from probiotics, but in particular, they offer significant antimicrobial effects, primarily as a result of their ability to secrete organic acids and various bacteriostatic peptides. What makes Probio Forte so exceptional? 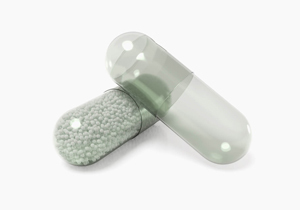 Probio Forte is delivered in highly innovative capsules which maximise the survival of the probiotics: DRCaps™. These capsules protect their contents not only from stomach acids but also from moisture, so helping to maximise their survival throughout their shelf life. Certified vegan, GMO-free, halal and kosher, these capsules were awarded the top prize in the Best New Plant, Process and Technology category by the well-known publication Nutraceutical Business and Technology (NBT). How does this technology work? A scan-based in vivo study (19) has shown that release of the capsules’ contents occurs an average of 52 minutes after ingestion. This delayed release means the probiotics are protected during their journey through the acid environment of the stomach. Without the use of such technology, most probiotics would not survive as far as the gut and would therefore be unable to multiply. To ensure the long-term life of the probiotics, they need to enter a state of ‘dormancy’ and are therefore dehydrated. There are two main ways of doing this: spray-drying and freeze-drying (lyophilisation). Spray-drying consists of atomising the fluid containing the probiotic strains and placing it in contact with hot air to reduce it to powder. It’s the cheapest and fastest method, but it subjects the probiotics to harsh conditions (20) (very high temperatures, osmotic stress, oxidative stress (21), disintegration of lipid membranes (22), etc) which inevitably destroys some of the probiotics (23). With this technique, it’s therefore impossible to guarantee that the numbers of bacteria indicated on the pack is the same as what is ultimately viable. That’s why SuperSmart has chosen to use freeze-drying, a longer and more costly process, but one which gives the probiotics optimal stability (24). It involves dehydrating previously-frozen probiotics by sublimation. Note: even though non-live bacteria are able to exert effects on immunity, it is scientifically recognised that the most important factor when choosing a probiotic formulation is the amount of live bacteria that reach the gut. In addition to opting for freeze-drying in the manufacture of these supplements, SuperSmart has also followed the latest scientific recommendations (25) and added natural ingredients that further protect the probiotics. (25). 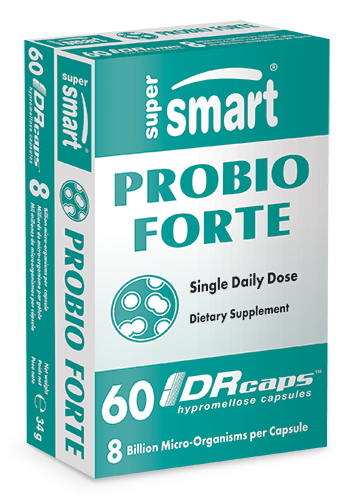 Probio Forte thus contains a natural extract of chicory root called inulin, an indigestible carbohydrate which both stimulates the growth of bifidobacteria (26) and maximises probiotic viability during manufacture and storage. These natural polysaccharides act as lyoprotectants, reducing the formation of ice crystals during the manufacturing process and minimising cellular damage to probiotics during storage. How can you optimise Probio Forte’s efficacy? Should Probio Forte be kept refrigerated? It’s best to store this product at a low temperature and in conditions of low humidity to maintain the highest possible number of bacteria in a ‘viable’ state. That’s why SuperSmart stores all its Probio Forte stock in refrigerated conditions. However, storing them at room temperature for a period of a few weeks will not produce a significant decrease in numbers of viable bacteria. This is because of the addition of natural ingredients which specifically increase the probiotics’ survival rate when stored at less-than-ideal temperatures. What happens to Probio Forte probiotics once they’ve been ingested? Once ingested, the probiotics are released in the gut where they are immediately rehydrated. No longer dormant, they begin multiplying, competing with other bacteria to adhere to the intestinal wall. The survival and growth of the probiotics in the gastrointestinal tract is essential if they are to influence microbial populations and exert their beneficial effects. Studies show that probiotics need to be taken repeatedly and regularly in order to produce sustained growth and measurable effects. Even when the probiotics are protected from stomach acids by delivery in DR Caps™, they should still be taken on an empty stomach with a glass of water in order to reduce this acidity as much as possible and ensure a better chance of survival for the few bacteria which may have been released too early. Should you change your diet when taking Probio Forte? It is advisable to very gradually increase your dietary fibre intake (from fruits, vegetables, whole grains), so as to provide the probiotics with the right conditions for their growth. Such fibre is actually considered to be ‘prebiotic’. Other ingredients: cornstarch, chicory inulin, magnesium stearate. Each vegetarian capsule contains 8 billion micro-organisms. Take one DR Caps™ a day, preferably on an empty stomach. While Probio Forte is stable at room temperature (20°C), once opened, it is advisable to keep it refrigerated.